The Contracts Administration Office is responsible for processing, reviewing and approving contracts from various departments within Texas A&M System’s Health Science Center (HSC). Here is how we use Laserfiche Workflow to decrease processing time from six to eight weeks to one and two weeks per contract. Contracts originate in different HSC departments, including the College of Medicine, the College of Nursing, the College of Pharmacy, the College of Dentistry and the School of Rural Public Health. 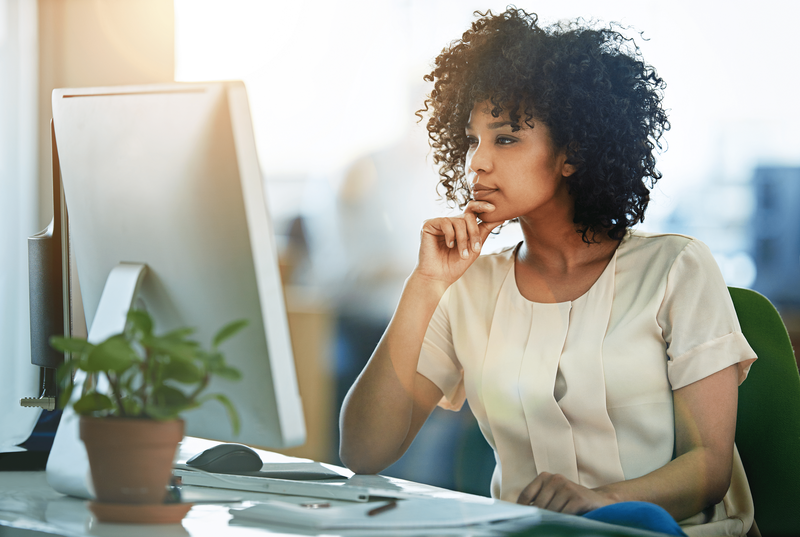 Staff from those departments can either scan documents directly into the For HSC Review folder in Laserfiche or use the Laserfiche Snapshot to print the documents into the folder. During this scanning or printing process, the staff member manually enters the required metadata into the document’s template. In the template screenshot below, all the fields denoted in red are required. Once a document has been stored in Laserfiche, the review process begins. 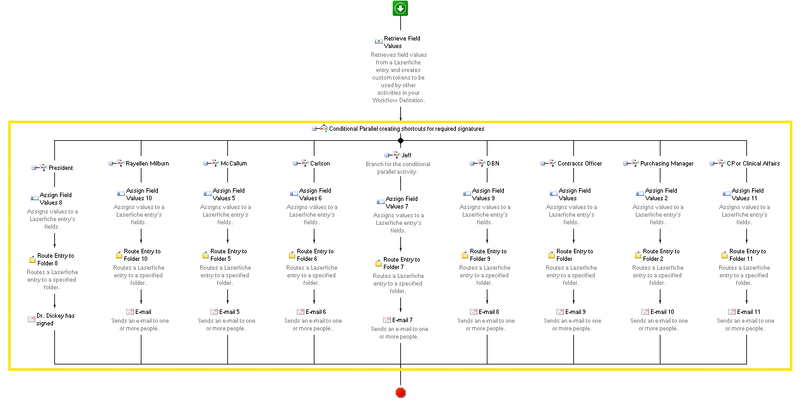 We have set up a series of template-driven workflows to facilitate the process. Different people in the Contracts Administration Office are responsible for managing different types of contracts. For example, contracts from the College of Medicine and College of Nursing are assigned to one staff member (HSC Component Contact) while contracts from the School of Rural Public Health are assigned to someone else. 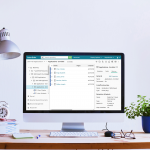 The first workflow takes each contract from the For HSC Review folder and, depending on where it originated, routes it to the folder of the specific HSC Component Contact who will be managing the contract. 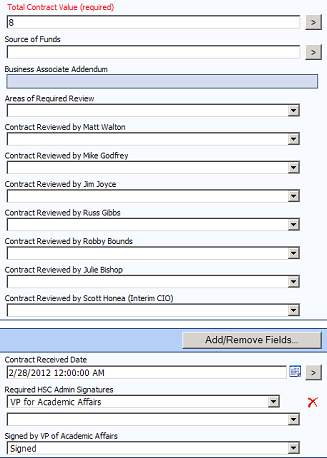 Workflow then automatically populates the Contract Number field in the template with the document’s Laserfiche Entry ID. Both the HSC Component Contact and the person submitting the contract receive an e-mail stating that the contract has been received. This e-mail also contains the Contract Number, inserted as a token, in order to simplify tracking. As part of our template, we have a multi-value field named Areas of Requested Review. 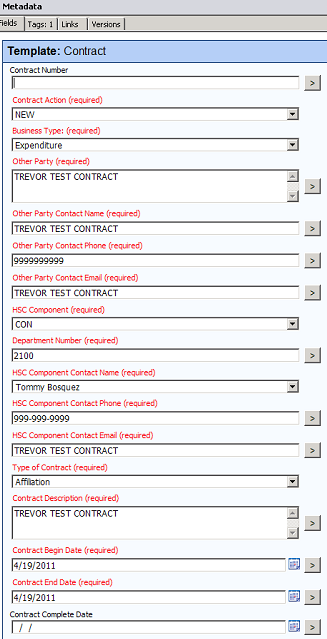 The HSC Component Contact populates this field with the names of the people who will need to review the contract. 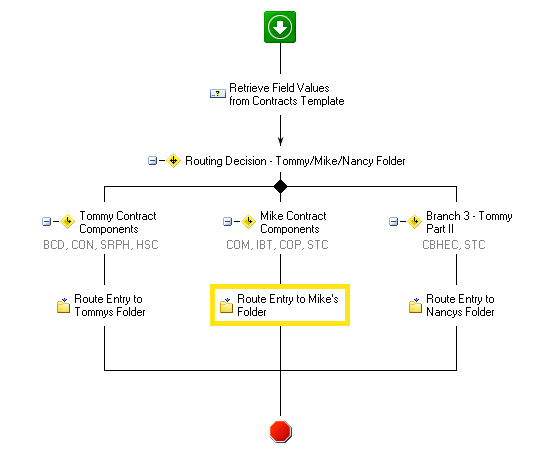 Another workflow then uses the Conditional Parallel activity to route a shortcut of the contract document to each reviewer’s folder in the Laserfiche repository. In addition, Workflow e-mails every reviewer a shortcut to the document. This process enables simultaneous review of the contract by all the required parties. 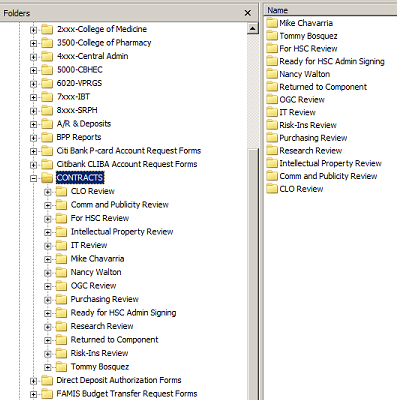 The actual contract document is stored in the HSC Component Contact’s folder. Click on the image above to view larger in a new window. The reviewers make comments and corrections on the original document. Once they finish reviewing the contract, they mark the specific field in the template that pertains to them. If changes need to be made before the contract can be approved, Workflow moves the contract to a Returned to Component folder in the repository. The person who initially submitted the contract receives an e-mail letting him know that the contract has been reviewed and that there are changes that need to be made before it can be approved. He opens the contract in Laserfiche from the shortcut included in the e-mail and creates a new contract with all the necessary changes. The pages of the revised contract are appended to the old contract which enables the changes to the contract to be tracked. This contract is then resubmitted. This time around, the contract is automatically routed to the same HSC Component Contact and no new Contract Number is assigned. This review process is repeated until everyone agrees on the finalized version of the contract. Certain contracts may also be routed to General Counsel for an additional review after the initial review process is complete. After the contract has been finalized, it must obtain approval signatures. We use a Conditional Parallel activity in Workflow since the contract has to be signed by multiple parties at various levels. When the contract is ready to be signed, an e-mail, which includes a shortcut to the document, is sent to each person who needs to sign the contract. People sign the contract by appending a personal stamp to the document and then updating a particular field in the template. Contracts that have been signed and finalized are moved into a record series where various staff can access and review them as needed. Meet with all of the users involved in the business process and get them involved in designing the workflows. Be ready to adjust your workflows if necessary to account for changing business requirements. Set up security on templates so that only the people who need to edit certain fields can see them. This will eliminate user confusion and reduce data entry problems. Use security tags if you want certain users to be able to view only certain documents and not the entire contents of a particular folder. Get started automating your organization’s contract management process by downloading this free guide.